Identify three special properties of water that make it unusual for a molecule of its size, and explain how these result from hydrogen bonding. Explain what is meant by hydrogen bonding and the molecular structural features that bring it about. Describe the "structure", such as it is, of liquid water. Sketch out structural examples of hydrogen bonding in three small molecules other than H2O. Describe the roles of hydrogen bonding in proteins and in DNA. Most students of chemistry quickly learn to relate the structure of a molecule to its general properties. Thus we generally expect small molecules to form gases or liquids, and large ones to exist as solids under ordinary conditions. And then we come to H2O, and are shocked to find that many of the predictions are way off, and that water (and by implication, life itself) should not even exist on our planet! In this section we will learn why this tiny combination of three nuclei and ten electrons possesses special properties that make it unique among the more than 15 million chemical species we presently know. In water, each hydrogen nucleus is covalently bound to the central oxygen atom by a pair of electrons that are shared between them. In H2O, only two of the six outer-shell electrons of oxygen are used for this purpose, leaving four electrons which are organized into two non-bonding pairs. The four electron pairs surrounding the oxygen tend to arrange themselves as far from each other as possible in order to minimize repulsions between these clouds of negative charge. This would ordinarily result in a tetrahedral geometry in which the angle between electron pairs (and therefore the H-O-H bond angle) is 109.5°. However, because the two non-bonding pairs remain closer to the oxygen atom, these exert a stronger repulsion against the two covalent bonding pairs, effectively pushing the two hydrogen atoms closer together. The result is a distorted tetrahedral arrangement in which the H—O—H angle is 104.5°. The H2O molecule is electrically neutral, but the positive and negative charges are not distributed uniformly. This is illustrated by the gradation in color in the schematic diagram here. The electronic (negative) charge is concentrated at the oxygen end of the molecule, owing partly to the nonbonding electrons (solid blue circles), and to oxygen's high nuclear charge which exerts stronger attractions on the electrons. This charge displacement constitutes an electric dipole, represented by the arrow at the bottom; you can think of this dipole as the electrical "image" of a water molecule. Opposite charges attract, so it is not surprising that the negative end of one water molecule will tend to orient itself so as to be close to the positive end of another molecule that happens to be nearby. The strength of this dipole-dipole attraction is less than that of a normal chemical bond, and so it is completely overwhelmed by ordinary thermal motions in the gas phase. However, when the H2O molecules are crowded together in the liquid, these attractive forces exert a very noticeable effect, which we call (somewhat misleadingly) hydrogen bonding. And at temperatures low enough to turn off the disruptive effects of thermal motions, water freezes into ice in which the hydrogen bonds form a rigid and stable network. Notice that the hydrogen bond (shown by the dashed green line) is somewhat longer than the covalent O—H bond. It is also much weaker, about 23 kJ mol–1 compared to the O–H covalent bond strength of 492 kJ mol–1. Forty-one anomalies of water" — some of them rather esoteric. Water has long been known to exhibit many physical properties that distinguish it from other small molecules of comparable mass. Although chemists refer to these as the "anomalous" properties of water, they are by no means mysterious; all are entirely predictable consequences of the way the size and nuclear charge of the oxygen atom conspire to distort the electronic charge clouds of the atoms of other elements when these are chemically bonded to the oxygen. The most apparent peculiarity of water is its very high boiling point for such a light molecule. Liquid methane CH4 (molecular weight 16) boils at –161°C. As you can see from this diagram, extrapolation of the boiling points of the various Group 16 hydrogen compounds to H2O suggests that this substance should be a gas under normal conditions. The Effects of Hydrogen Bonding on Boiling Points. These plots of the boiling points of the covalent hydrides of the elements of groups 14–17 show that the boiling points of the lightest members of each series for which hydrogen bonding is possible (HF, NH3, and H2O) are anomalously high for compounds with such low molecular masses. Compared to most other liquids, water also has a high surface tension. Have you ever watched an insect walk across the surface of a pond? The water strider takes advantage of the fact that the water surface acts like an elastic film that resists deformation when a small weight is placed on it. (If you are careful, you can also "float" a small paper clip or steel staple on the surface of water in a cup.) This is all due to the surface tension of the water. A molecule within the bulk of a liquid experiences attractions to neighboring molecules in all directions, but since these average out to zero, there is no net force on the molecule. For a molecule that finds itself at the surface, the situation is quite different; it experiences forces only sideways and downward, and this is what creates the stretched-membrane effect. The distinction between molecules located at the surface and those deep inside is especially prominent in H2O, owing to the strong hydrogen-bonding forces. The difference between the forces experienced by a molecule at the surface and one in the bulk liquid gives rise to the liquid's surface tension. This drawing highlights two H2O molecules, one at the surface, and the other in the bulk of the liquid. The surface molecule is attracted to its neighbors below and to either side, but there are no attractions pointing in the 180° solid angle angle above the surface. As a consequence, a molecule at the surface will tend to be drawn into the bulk of the liquid. But since there must always be some surface, the overall effect is to minimize the surface area of a liquid. The geometric shape that has the smallest ratio of surface area to volume is the sphere, so very small quantities of liquids tend to form spherical drops. As the drops get bigger, their weight deforms them into the typical tear shape. The most energetically favorable configuration of H2O molecules is one in which each molecule is hydrogen-bonded to four neighboring molecules. Owing to the thermal motions described above, this ideal is never achieved in the liquid, but when water freezes to ice, the molecules settle into exactly this kind of an arrangement in the ice crystal. This arrangement requires that the molecules be somewhat farther apart then would otherwise be the case; as a consequence, ice, in which hydrogen bonding is at its maximum, has a more open structure, and thus a lower density than water. Here are three-dimensional views of a typical local structure of water (left) and ice (right.) Notice the greater openness of the ice structure which is necessary to ensure the strongest degree of hydrogen bonding in a uniform, extended crystal lattice. The more crowded and jumbled arrangement in liquid water can be sustained only by the greater amount of thermal energy available above the freezing point. When ice melts, the more vigorous thermal motion disrupts much of the hydrogen-bonded structure, allowing the molecules to pack more closely. Water is thus one of the very few substances whose solid form has a lower density than the liquid at the freezing point. Localized clusters of hydrogen bonds still remain, however; these are continually breaking and reforming as the thermal motions jiggle and shove the individual molecules. As the temperature of the water is raised above freezing, the extent and lifetimes of these clusters diminish, so the density of the water increases. At higher temperatures, another effect, common to all substances, begins to dominate: as the temperature increases, so does the amplitude of thermal motions. This more vigorous jostling causes the average distance between the molecules to increase, reducing the density of the liquid; this is ordinary thermal expansion. Because the two competing effects (hydrogen bonding at low temperatures and thermal expansion at higher temperatures) both lead to a decrease in density, it follows that there must be some temperature at which the density of water passes through a maximum. This temperature is 4° C; this is the temperature of the water you will find at the bottom of an ice-covered lake in which this most dense of all water has displaced the colder water and pushed it nearer to the surface. the molecules undergo rapid thermal motions on a time scale of picoseconds (10–12 second), so the lifetime of any specific clustered configuration will be fleetingly brief. In the 1950's it was assumed that liquid water consists of a mixture of hydrogen-bonded clusters (H2O)n in which n can have a variety of values, but little evidence for the existence of such aggregates was ever found. The present view, supported by computer-modeling and spectroscopy, is that on a very short time scale, water is more like a "gel" consisting of a single, huge hydrogen-bonded cluster. On a 10–12-10–9 sec time scale, rotations and other thermal motions cause individual hydrogen bonds to break and re-form in new configurations, inducing ever-changing local discontinuities whose extent and influence depends on the temperature and pressure. Ice, like all solids, has a well-defined structure; each water molecule is surrounded by four neighboring H2Os. two of these are hydrogen-bonded to the oxygen atom on the central H2O molecule, and each of the two hydrogen atoms is similarly bonded to another neighboring H2O. Ice forms crystals having a hexagonal lattice structure, which in their full development would tend to form hexagonal prisms very similar to those sometimes seen in quartz. This does occasionally happen, and anyone who has done much winter mountaineering has likely seen needle-shaped prisms of ice crystals floating in the air. 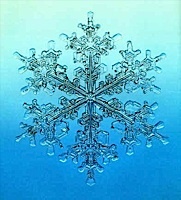 Under most conditions, however, the snowflake crystals we see are flattened into the beautiful fractal-like hexagonal structures that are commonly observed. The H2O molecules that make up the top and bottom plane faces of the prism are packed very closely and linked (through hydrogen bonding) to the molecules inside. In contrast to this, the molecules that make up the sides of the prism, and especially those at the hexagonal corners, are much more exposed, so that atmospheric H2O molecules that come into contact with most places on the crystal surface attach very loosely and migrate along it until they are able to form hydrogen-bonded attachments to these corners, thus becoming part of the solid and extending the structure along these six directions. This process perpetuates itself as the new extensions themselves acquire a hexagonal structure. At temperatures as low as 200 K, the surface of ice is highly disordered and water-like. As the temperature approaches the freezing point, this region of disorder extends farther down from the surface and acts as a lubricant. The illustration is taken from from an article in the April 7, 2008 issue of C&EN honoring the physical chemist Gabor Somorjai who pioneered modern methods of studying surfaces. To a chemist, the term "pure" has meaning only in the context of a particular application or process. The distilled or de-ionized water we use in the laboratory contains dissolved atmospheric gases and occasionally some silica, but their small amounts and relative inertness make these impurities insignificant for most purposes. When water of the highest obtainable purity is required for certain types of exacting measurements, it is commonly filtered, de-ionized, and triple-vacuum distilled. But even this "chemically pure" water is a mixture of isotopic species: there are two stable isotopes of both hydrogen (H1 and H2, the latter often denoted by D) and oxygen (O16 and O18) which give rise to combinations such as H2O18, HDO16, etc., all of which are readily identifiable in the infrared spectra of water vapor. And to top this off, the two hydrogen atoms in water contain protons whose magnetic moments can be parallel or antiparallel, giving rise to ortho- and para-water, respectively. The two forms are normally present in a o/p ratio of 3:1. The amount of the rare isotopes of oxygen and hydrogen in water varies enough from place to place that it is now possible to determine the age and source of a particular water sample with some precision. These differences are reflected in the H and O isotopic profiles of organisms. Thus the isotopic analysis of human hair can be a useful tool for crime investigations and anthropology research. Hydrogen bonds form when the electron cloud of a hydrogen atom that is attached to one of the more electronegative atoms is distorted by that atom, leaving a partial positive charge on the hydrogen. Owing to the very small size of the hydrogen atom, the density of this partial charge is large enough to allow it to interact with the lone-pair electrons on a nearby electronegative atom. Although hydrogen bonding is commonly described as a form of dipole-dipole attraction, it is now clear that it involves a certain measure of electron-sharing (between the external non-bonding electrons and the hydrogen) as well, so these bonds possess some covalent character. Hydrogen bonds are longer than ordinary covalent bonds, and they are also weaker. The experimental evidence for hydrogen bonding usually comes from X-ray diffraction studies on solids that reveal shorter-than-normal distances between hydrogen and other atoms. The following examples show something of the wide scope of hydrogen bonding in molecules. Ammonia (mp –78, bp –33°C) is hydrogen-bonded in the liquid and solid states. Hydrogen bonding is responsible for ammonia's remarkably high solubility in water. Many organic (carboxylic) acids form hydrogen-bonded dimers in the solid state. Here the hydrogen bond acceptor is the π electron cloud of a benzene ring. This type of interaction is important in maintaining the shape of proteins. Hydrogen fluoride (mp –92, bp 33°C) is another common substance that is strongly hydrogen-bonded in its condensed phases. The bifluoride ion (for which no proper Lewis structure can be written) can be regarded as a complex ion held together by the strongest hydrogen bond known: about 155 kJ mol–1. "As slow as molasses in the winter!" Multiple hydroxyl groups provide lots of opportunities for hydrogen bonding and lead to the high viscosities of substances such as glycerine and sugar syrups. Hydrogen bonding of water molecules to –OH groups on the polymer chain ("bound water") that helps maintain the shape of the polymer. The examples that follow are representative of several types of biopolymers. 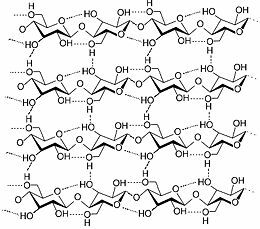 Cellulose is a linear polymer of glucose (see above), containing 300 to over 10,000 units, depending on the source. As the principal structural component of plants (along with lignin in trees), cellulose is the most abundant organic substance on the earth. The role of hydrogen bonding is to cross-link individual molecules to build up sheets as shown here. These sheets than stack up in a staggered array held together by van der Waals forces. Further hydrogen-bonding of adjacent stacks bundles them together into a stronger and more rigid structure. These polymers made from amino acids R—CH(NH2)COOH depend on intramolecular hydrogen bonding to maintain their shape (secondary and tertiary structure) which is essential for their important function as biological catalysts (enzymes). Hydrogen-bonded water molecules embedded in the protein are also important for their structural integrity. Although carbon is not usually considered particularly electronegative, C—H----X hydrogen bonds are also now known to be significant in proteins. Who you are is totally dependent on hydrogen bonds! DNA, as you probably know, is the most famous of the biopolymers owing to its central role in defining the structure and function of all living organisms. Each strand of DNA is built from a sequence of four different nucleotide monomers consisting of a deoxyribose sugar, phosphate groups, and a nitrogenous base conventionally identified by the letters A,T, C and G. DNA itself consists of two of these polynucleotide chains that are coiled around a common axis in a configuration something like the protein alpha helix depicted above. The sugar-and-phosphate backbones are on the outside so that the nucleotide bases are on the inside and facing each other. The two strands are held together by hydrogen bonds that link a nitrogen atom of a nucleotide in one chain with a nitrogen or oxygen on the nucleotide that is across from it on the other chain. Figure: Chemical structure of DNA; hydrogen bonds shown as dotted lines. Image used with permisison from Wikipedia. Efficient hydrogen bonding within this configuration can only occur between the pairs A-T and C-G, so these two complementary pairs constitute the "alphabet" that encodes the genetic information that gets transcribed whenever new protein molecules are built. Water molecules, hydrogen-bonded to the outer parts of the DNA helix, help stabilize it.